It features prominently on the walls of many passionate travelers: a large map of the world showing off all their traveled routes. No need to bother with pushpins or paper maps any longer though: today the Dutch startup Polarsteps is launching an app and website that allows travelers to easily and automatically track their adventures. 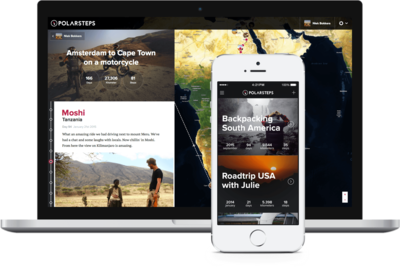 Polarsteps is the first travel blog that doesn’t require you removing your phone from your pocket. 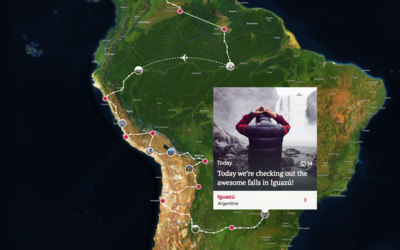 Polarsteps was created by 4 enthusiastic adventurers with a passion for travel, design and coding. 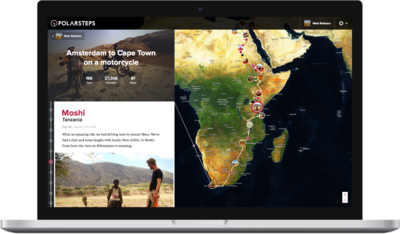 One of the founders, Niek Bokkers, gave birth to the first prototype of Polarsteps because of his need for a beautiful travel log that would help keep friends and family at home up to date. "Many travelers go on these awesome trips, but forget exactly where they’ve been when they get back home. Polarsteps fixes that. ", says Bokkers. Making creative use of the latest technologies, the app allows travelers to capture their route, pictures and places visited on the go. "Whenever an internet connection is available the information is automatically updated on an interactive world map, together with cool statistics about the journey. This map can be shared in real time with friends and family at home", Koen Droste, CEO of Polarsteps, explains. The first prototype of Polarsteps caused a stir a few years ago, when Niek wrote a small app on a sailing trip that shared trip updates with his family via a satellite phone. Several prototypes were tested on trips to Mongolia in a Jeep Cherokee and to South Africa on motorcycle. Based on those experiences, an iPhone app was developed for a greater audience, available for download in the app store as of today. Android users will have to wait a little longer for the app, but can already keep track of their trips via the beta version of the desktop website at www.polarsteps.com.